Black field cricket is a serious pasture pest in Northland, Auckland, parts of the Waikato, Bay of Plenty, Hawkes Bay and Manawatu. It especially likes clay soils prone to cracking in dry summers. 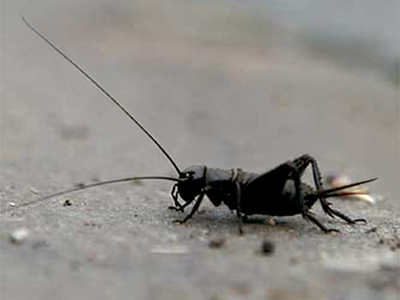 Crickets feed above ground at night and take refuge in cracks in the soil during the day. Crickets feed outwards from the cracks, defoliating and killing pasture grasses. They are selective feeders,preferring grasses but also eating legumes, weeds and seed. Pastures are more susceptible to damage in their first year. On heavier soils, damage shows clearly as bare patches associated with soil cracks. Damage on lighter soils is often harder to see, as seeds and seedlings eaten by crickets are often covered by pasture - but if the bare earth is revealed when the pasture is pushed away by hand, cricket feeding may be seen. If crickets are suspected but not visible, a weak solution of household detergent in water can be used to flush crickets from cracks in the soil. The potential for severe long term pasture damage makes early detection very important. Crickets can quickly defoliate and kill older grasses with high grazing pressure on the crown. Populations greater than 10/m2 are considered economically damaging. At 20/m2 they can consume up to 16 kg DM/ha/day, and populations can reach 100 to 150/m2. Crickets can be effectively controlled using maldison-grain baits, applied at a rate relative to the population base.